My Red Bull team have had an up and down start to the season but we're pretty happy with the two points I got for seventh place in Malaysia on Sunday. 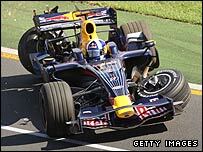 We had a bad race in Australia, where neither I nor my team-mate David Coulthard finished, and the Malaysia weekend did not get off to a good start. David had a suspension failure on Friday - the adhesives in his carbon-fibre steering arm failed, and then the suspension came apart when he hit a kerb on his way off the track. That came after Australia when my suspension broke following the lightest of touches on the first lap, and David's then fractured after he was pitched into the air by Felipe Massa's Ferrari. On top of that, I had an engine failure on Friday in Malaysia, so it was a very difficult day, and if you'd said then we'd get two points, we'd have taken it! But the good thing is the cars ran very well in the race, which is a booster for the factory and a little pointer to Formula One's governing body, the FIA, that we are going in the right direction for them. There has been a slight modification to the pushrods, which should address the problem, and the FIA seems to be happy after they asked the team for a report into the safety of the cars in Malaysia. Qualifying was strong for us - I was eighth fastest before being promoted to sixth when the McLarens were penalised. That put us in a good position, and then I had a good first lap, getting up to fourth, which helped lay the foundations for the result. We knew we couldn't take the fight to Ferrari, McLaren and BMW. And Jarno Trulli's Toyota was obviously strong, which was a little bit surprising. But it was a busy race - every lap I had someone within a second or so of me, with Lewis Hamilton for most of it, and Fernando Alonso in the last stint. You have to be very accurate with your braking points when you have guys that close, to stop them having a sniff. No-one's going to pass you in the middle sector of the lap, so you basically have to concentrate on getting a really good exit out of Turn 14, the penultimate corner on to the first of the long straights. I knew that if I did that, no-one was going to get past me. Lewis was definitely quicker than me, but it wasn't like warp speed, he wasn't all over me. And in these cars it's so hard to follow. He has to wait until I get on the power and once I am, I'm gone again. Even if he had 6-7 km/h advantage on the straight, that's not enough to get close. We had a bit of a fuel pick-up problem so we had to over-fill the car at the second and third stops, so that affected our pace a little bit towards the end. It would have been nice to come out of the pits ahead of Nick Heidfeld's BMW and compromise his run to the flag. Instead, it was Fernando behind me. He's pretty tough, but he didn't have the same top speed advantage that Lewis had and I knew as long as I stayed on my line he wasn't going anywhere. So we're happy with two points. There were a couple of retirements ahead of us, but we weren't lucky this weekend. Nevertheless, it's very tight in that midfield group, and it's very easy not to score points. The team has a lot of work to do on the performance of the car because if we don't keep adding performance items to it we are going to go backwards. I was pretty spot on with my predictions for the various teams' competitiveness in my first column. Ferrari had some reliability problems in Australia, but they had an edge on performance over McLaren in Malaysia, and I can see that continuing. Behind the big two or three teams, it's going to be tight again in Bahrain next time out. Getting into the final qualifying session is a challenge, and what's going to make the difference between us, Williams, Renault and Toyota is how consistent we are from circuit to circuit. And that's going to be down to race engineering and the car and understanding the venues. Off the track, there has been a bit of discussion about Lewis not being involved in the Grand Prix Drivers' Association. And the first thing to say is that it has been blown totally out of proportion. Because of his position in the sport, everything is put under the microscope, and given time I believe he will want to be a member. The GPDA is an important organisation. I'm one of the two directors of it, along with Fernando, while Pedro de la Rosa, McLaren's test driver, is the chairman. Our job is to represent the drivers in discussions with the FIA on safety issues - circuit design, safety cars, driving in the rain and so on. It is good for us to be involved in these discussions, because we're the ones driving the cars. We know what we're going through out there. We have a voice and it is an important one. Although it would be great to have Lewis there, at the moment it's not a big deal that he isn't. He's not the only one - Kimi Raikkonen, Adrian Sutil and Anthony Davidson are also not members. There's no doubt that if Lewis and Kimi, as the two guys fighting for the championship, were in it, it would give us a bit more cement under our feet, but I'm not too worried about it. It doesn't make it any more difficult to get things pushed through, but it would give us a bit more unity. We have a lot of respect between the drivers and we have come up with some good ideas. And our relationship with the FIA race director Charlie Whiting has never been better. Kimi's not interested in that sort of thing, that's just the way he is. But Lewis is a different character and I'm sure he will come in eventually, and when he does, he'll be happy to get involved. What did you think of Patrick Head's idea to reverse the grids to spice up the show? I can see his point - it's very difficult to overtake, and for Lewis in Malaysia stuck behind me, for example, it is so frustrating. But I was a bit disappointed by the specific suggestion. There are lots of things we can do if we want to do that, but that's absolutely full showbiz. A lot of damaged cars. Good for the fans and good TV. It's such a big subject - how far do you go to help the show? If you have the fastest cars at the front there's not going to be a lot of overtaking. In the '70s and '80s it was easier to overtake, but with these cars it's very difficult. Tiger Woods doesn't have to tee 30 yards further back because he's playing better. It's like the ballasting you get in other categories of motorsport like touring cars. It works pretty well, but it's so hard for the punters to understand - [World touring car champion] Andy Priaulx's driving round with 40kg more ballast than the guy in front of him. One of the best ideas I've heard is maybe the races should be a bit shorter. A Grand Prix should be a grand challenge, but maybe they are a bit long-winded. Given Lewis's seat at McLaren last season, what would you have done? 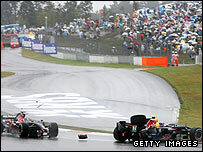 Would you have challenged Alonso at every opportunity? Or would you have deferred to Alonso? If you find out quickly that you can operate at the same level pace-wise, then you grab the opportunity with both hands. It is to his credit that he did do that. When you are at this level, it is suicide not to do that if you have the pace to do it. And if I could operate at his level then of course I would have done it. Who do you blame for what happened in Japan last year, when you were taken out of second place by Sebastian Vettel while following Hamilton behind the safety car? Well, Lewis has admitted he didn't do a great job behind the safety car. He was accelerating and braking very inconsistently, trying to look after his brakes, and that's what caught Sebastian out. So both of them together obviously. It caused a bit of a chain reaction. I was sitting beside Lewis thinking, well, when are you going to go again? Because the safety car was a long, long way away. And Vettel came in. It was probably triggered by Lewis, but Vettel obviously did the job in terms of not concentrating. What do you want to do when you stop driving? Probably a bit less travel. I love sport, so I'll definitely be involved in something to do with sport, but what sport I don't know. It could be a possibility to remain in car racing in some way. But I like to see people testing themselves, backing themselves and having a go. That's why I do adventure races such as the Tasmania Challenge. I get great satisfaction from that. 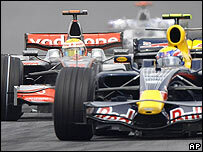 What do you think about general direction of F1 and the increasing standardisation of the cars? F1 has been the absolute pinnacle for so many years, and it still is. Over time they have continued to clamp down on lots of things. It is still the cutting edge of technology in terms of getting a car around a track but I don't want the sport to become too basic. I want engineers to still be able to push themselves and have some unique ideas to have quick cars. We need to keep that in F1. These cars are leading edge, and they are great to look at. What do you think about Bernie Ecclestone pushing Australia to have a night race or risk losing their Grand Prix? It's going to be very difficult to hold a night race there. You're talking about 80 acres of parkland. You've got to remember there are 150,000 people walking around. It's not like a city like Singapore where you can just light the track and the rest of the city is lit anyway because that's what happens in a city at night. A park is not lit up at night to that extent, and the amount of lighting they would need to have 150,000 people walking around safely is very challenging. I hope we can continue to make it work with the times we have now. Bernie is very determined to look after the Europeans in terms of viewing and we need to work as hard as possible to keep the race there. If it is a night race I'd be up for that, but I don't see it working. How does it feel to be the only Australian on the grid and have the pressures of the whole nation on your shoulders? I'm proud. I have the Australian flag on my suit and the Australian coat of arms on my helmet and I'm proud to race with those every time I get in the car. Every now and again I do think it would be nice to have someone else to spread the load a bit in terms of the press and the interest when I am in Australia. I like the feeling down there. It's a very difficult sport to understand but a lot of fans follow it and the support I have is great. What is the state of Australian motorsport and are there any prospects for anyone following you into F1? We have such a big carrot in Australia in the touring cars. It it is very easy for the youngsters to slide into that competition because it's at home. It's comfortable and they earn a reasonable living from that. That's good. But I would encourage more youngsters to have a crack at coming overseas and getting through the junior categories in Europe as best you can and try to follow your dream and get to F1. It's incredibly tough, and then keeping your seat, that's when the fun really begins - you've got to deliver every single race. It's a competitive business. There are a few guys in Formula Three and coming through. We'll see.